Say hello to the STETT Performance BMW E9X N52 N54 N55 oil cooler kit. Say goodbye to 260+ degree oil temps with your factory oil cooler. 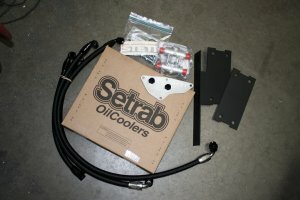 Unlike other aftermarket oil coolers out there that piggy back off the factory oil cooler, our oil cooler is a complete standalone system- meaning for those without a factory oil cooler, there is no need to purchase a factory oil cooler before installing ours which saves you well over $1,000. For those with factory oil coolers, our system completely replaces all of the weak factory components. Net result: a 20%, 30% or more reduction in oil temperatures. Simply put, this is the best performing kit on the market bar none. As with all of our products we use only the finest quality components: CNC laser cut mounting brackets, CNC machined 6061 T6 aluminum adapter plate, lightweight braided hose, CNC machined aircraft grade aluminum fittings, Mocal high flow thermostat and a core from the best name in the busines- Setrab.